Why Championship Football Games are Called "Bowls"
Today I found out why championship football games are called “bowls”. In 1901, the Roses Association sponsored a college Tournament East-West football game between Michigan and Stanford. In this game, Stanford quit in the third quarter, being down 49-0. For the next 15 years, this annual event stopped featuring football, rather featured other events such as chariot racing. However, in 1916, the Roses Association decided to sponsor a football tournament once again, this time between WSU (then called The State College of Washington) and Brown. This game was held at Tournament Park in Pasadena, as were subsequent annual matches. Fast-forward five years and they had need of a stadium to play the game at, with attendance for this tournament having swelled massively. Myron Hunt was commissioned to design a stadium for this purpose which was completed two years later and named Rose Bowl. Like many other college football stadiums after, Rose Bowl was modeled after the design of Yale’s stadium, Yale Bowl, which got its name from the fact that it resembled a bowl, much like Rose Bowl. This tournament sponsored by the Roses Association then was named the “Rose Bowl”, after the stadium. Gradually other cities and universities with football teams saw the money making opportunities and promotional value of these tournament games and began creating their own “bowl” games, even though many of these games were not played in bowl shaped stadiums. The NFL eventually borrowed this terminology when they created the Pro Bowl in 1951. In 1970, the AFL and NFL merged and they created a championship game called the “AFL-NFL World Championship Game”. This game was called such for two years while the final details of the merger were being worked out. Upon the third “AFL-NFL World Championship Game” the merger was complete and this championship game was re-branded the “Super Bowl”, after the college naming convention. This third match-up, being called “Super Bowl III”, also set the tradition of using Roman numerals for the Super Bowl, rather than the year of the game. The Super Bowl is not “viewed by over a billion people in over 225 countries” every year. In fact, that number is typically more like around 100 million people with around 97% of that number residing in the United States. For more on this and other Super Bowl facts, click here. Lamar Hunt, who owned the Kansas City Chiefs and was also was the co-founder of the AFL, was the one who supposedly came up with the name “Super Bowl” rather than the “AFL-NFL World Championship Game”. In 2006, he stated he thought of it after watching his kids play with a Super Ball. However, there are numerous references to the game being unofficially called the “Super Bowl” before Hunt suggested that it be made the official name of the tournament game. So it is unlikely the “Super Ball” anecdote he told was true, but he was the one who championed making it the official name. Though, he stated that he only suggested it as a temporary name for the event while something better was thought up, but the name stuck. “NFL”, “Super Bowl” and “Super Sunday” are all trademarked by the NFL. As a result of this, any advertisement, event, promotion, etc. that wants to refer to any of these things has to come up with some colloquialism or be granted rights to do so by the NFL, which rarely happens. For the Super Bowl, the most popular colloquialism is “The Big Game”. As a result of this, the NFL tried, unsuccessfully, to trademark “The Big Game”. It is illegal, according to the NFL, to show the Super Bowl on any screen larger than 55 inches. They also do not allow the Super Bowl to be shown at any venue that wouldn’t normally show sporting events, such as churches or the like. The Rose Bowl has been host to the Super Bowl five times to date. 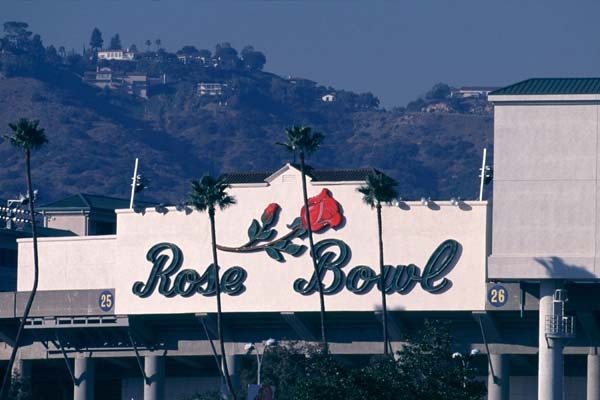 Other suggested names for Rose Bowl stadium were “Tournament of Roses Stadium” and “Tournament of Roses Bowl”. 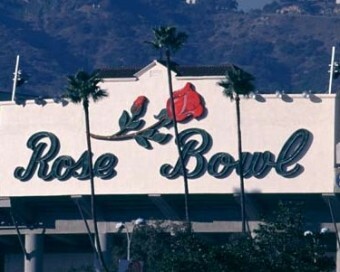 The Rose Bowl has been played at the stadium with the same name every year except 1942 when it was moved to Duke University due to concerns over security thanks to the attack on Pearl Harbor. “Stadium” originally meant “a foot race” or “an ancient measure of length”, which was about a furlong or 1/8 of a Roman mile. The name was also affixed to any track that was one stadium in length. This eventually became any running track and, finally, as we use it today to refer to any large structure used for sporting events.